For the second year running, an exciting swashbuckler has won through for his first European Tour victory in Turkey as American Brooks Koepka held off the challenge thrown out by from Ian Poulter to win the Turkish Airlines Open. 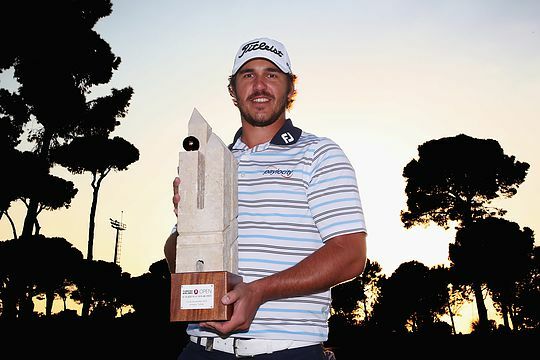 Koepka claimed his first European Tour title in Antalya, emulating the deeds of France’s Victor Dubuisson in 2013 and ensuring Rory McIlroy wins The Race to Dubai title for the second time in three years. Marcel Siem, Jamie Donaldson or Sergio Garcia needed to win in Turkey and at next week’s DP World Tour Championship to have a chance of overtaking McIlroy, who did not play this week. The American carded a flawless closing 65 at the Montgomerie Maxx Royal course to finish 17-under par, one shot ahead of Poulter, who missed a birdie putt from six feet on the 18th to force a play-off. “It’s a special week obviously, these four events and The Race to Dubai are ones you prepare for all year, and to win one of them is very special,” said Koepka. Poulter shot a final round 67 but Saturday’s 75 ultimately took a toll on the Brit’s chance of a first title in 2014. “Hats off to Brooks for a great round today, obviously he’s played some superb golf there.” Poulter said. World No. 6 Henrik Stenson, who defends his title in Dubai next week, carded a closing 64 to finish third on 14-under, one shot ahead of Miguel Angel Jiménez, overnight leader Wade Ormsby and English pair Andy Sullivan and Danny Willett. Ormsby started the day with a bogey and added two more on the front side, offsetting them with three birdies to make the turn even par for the day. However, with most of the leading contenders surging on the final day, even par was not going to keep pace and Ormsby was left nipping at the heels of the leaders for much of the day. The South Australian’s tie for fourth was a triumph on many fronts including banking the biggest cheque of his professional career – €394,625 (AU$564,000) – and earning qualification for the rich pickings on offer at the US$8 million DP World Tour Championship in Dubai this coming week.